An apple a day keeps the doctor away so they say. However, I don’t want to keep my doctor away so I don’t eat an apple a day. There are a variety of apples available throughout the year. Apples are a rich source of dietary fibre, potassium and flavonoids which help to inhibit the growth of carcinogenic substances.Eating an apple keeps you full for at least 2 to 3 hours. I prefer to eat apples in salads and not on its own. If I do have it on its own then I prefer it with a pinch of salt and red chilli powder. 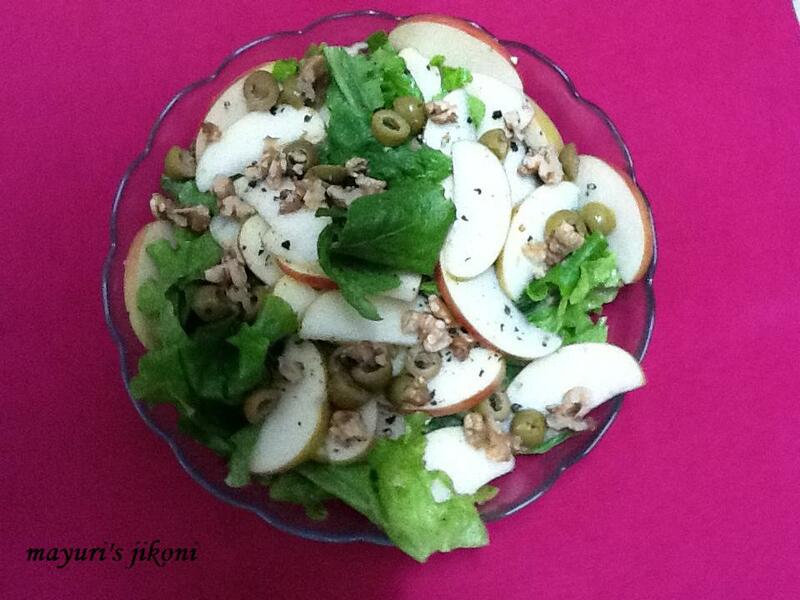 The crunchy apple salad is a very easy and quick dish to prepare. A nutritious but satisfying meal to have for lunch . Use any variety of apple you like. I had the pink lady variety so used that. I have even prepared it using the green apples and love it. In a small bowl whisk the dressing ingredients together with a small whisk or fork. Put all the ingredients for the salad in a serving bowl. If the salad leaves have wilted a bit, soak it in ice cold water for for 15 to 30 minutes. Remove from the water and pat dry the leaves with a tea towel. Mix 2 varieties of apples. Add cubes of cheese if you like. If you are serving the salad later, pour the dressing over it just before serving. However, remember to mix a bit of lemon juice with the apples so that they do not turn brown.